Are you looking for a place to establish your start-up’s operations? Is it time to move your growing business to a bigger office? Are you thinking of relocating your business to a more accessible location? If you’re in the market for office space in Stamford, CT or Westport, CT, keep in mind that there are several factors to consider. This is definitely a vital piece to your business’ success. In choosing the right location, ask yourself if your clients and employees can get there easily. Will there be easy access for both clients and employees to public transportation and parking? You also have to think of your client’s and employee’s safety going to and from the office. Check the security of the neighborhood. Be sure it will be convenient to get their food, drinks, and other necessities. Having an office space located near a mall, restaurants, cafes, and other shops can be advantageous. This will depend on the size of your workforce or if you’re going to need a dedicated space for client and employee meetings. Make sure that you have enough room for all of your staff to be comfortable. Consider the future, as well; will there be room for the company to grow? A reliable Internet connection will be essential to your office’s productivity. Easy access to other communication means, such as phone lines and postal service, will definitely help in making operations easier and more convenient. The design of the office, however, can affect the appearance of your business. If you’re inviting a big client over to your office, wouldn’t it be more impressive for them to see a well-designed office? 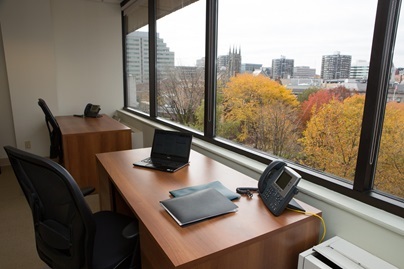 If you’re looking for a Connecticut office space that has all the essentials, Connecticut Business Centers is the best way to go. We offer two convenient locations that offer the best solutions. Moreover, they are equipped with fast Internet access and any tools you need for a successful meeting. For all your office space needs, choose Connecticut Business Centers!